The Best Robes for Lazy DaysOr whenever you just want maximum comfort. Beyoncé Cuts Ties With Topshop ChairmanFollowing his #MeToo scandal. Topshop Wants You to Swaddle Yourself in Neon VelvetThe highly anticipated Halpern x Topshop collection has finally arrived. Topshop Chairman Named in #MeToo ScandalA member of parliament said he is the subject of “serious and repeated” harassment claims. A Casual Date-Night Look That Isn’t Trying Too HardThe perfect amount of cool. Fake-News Jeans for the Fake-News Awards Red CarpetOrder now — the trending item is quickly selling out. Everyone Needs a Great Midi Skirt11 of the best under $100. Fashion People Are Dressing Like The MatrixAnd it’s so good. 18 Chic Pieces You Can Still Buy at the Nordstrom Anniversary SaleEverything goes back to regular prices August 7. From Cheap to Designer: 12 Pieces to Buy at Nordstrom’s Annual Half-Yearly SaleWhether you have $20 or $200, what to buy at every budget. Retailers Are Calling Culottes Out for Exactly What They Are: AwkwardAnd they’re not the worst pants on the market. Topshop’s New Affordable Bridal Line Launches TodayThe 25-piece collection includes bridesmaid and bridal gowns, lingerie, and accessories. 10 Spring Trench Coats Under $200And they’re not all tan. New Yorkers Frankly Too Busy Working to Show Up to Ivy Park LaunchSorry, Bey, we still love you! London Fashion Week’s Tribute to TetrisAnd four more things we liked yesterday. Rihanna Has More Socks to Sell YouNicki Minaj, Jenner Girls, and Katy Perry also share holiday collections. Watch the New Supermodels in Topshop’s Holiday Campaign It’s the most wonderful time of the year. 16 Feel-Good Winter AccessoriesCoziness from your head to your feet. Bright Coats for Cold Days New York women in winter’s least-boring outerwear, from bright-green alpaca fur to leopard-print mohair. 24 Affordable Pieces That Look Like GucciHow to pull off the Zucci trend. Topshop’s New ‘It’-Girl Campaign A short video starring Gigi Hadid. Topshop Will Ditch Dubiously Sized MannequinsThe latest retailer to concede that its fiberglass models are unreasonably proportioned. Topshop’s New Archive Collection Celebrates Its Greatest HitsThe brand’s greatest hits are coming back around. Get Out of Your Winter Rut With a Cool SkirtIt’ll thaw out soon. You Can Now Buy a Met Gala Gown on eBayTopshop is auctioning off its designs for Kendall Jenner, Chanel Iman, and more. 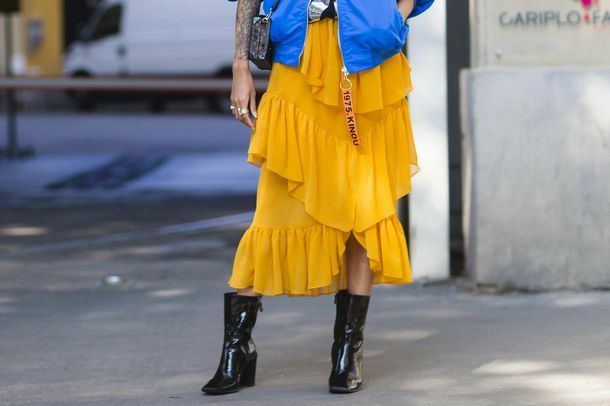 20 Chic, Comfortable Midi-Skirts to Wear All FallIt’s skirt-and-boots season. Beyoncé and Cara Delevingne Partied in Topshop Naomi Campbell, Paris Hilton, and Nick Jonas also turned out to celebrate the NYC flagship opening. Cara Delevingne Covers Herself in Twinkly LightsFor Topshop’s holiday campaign. Beyoncé Is Getting Into the Athleisure Game With a Topshop line. A Cool Striped Dress to Wear Through FallBeyoncé-approved. Every Single Time Beyoncé Has Worn TopshopSo many matching crop-top sets. The 52 Pieces to Get You Noticed by Photographers at Fashion WeekSurefire street-style bait. A Sleeveless Turtleneck to Transition You Into FallPerfect for a humid September. A Pleated Tunic to Transition to Fall Back to school. World Ravenous for Kate Moss Topshop CollectionCertain pieces sold out online in twenty minutes. 5 Ways to Wear Silver Like a Street-Style StarShine bright. A Chic Nautical Dress for a Summer EveningStripes with structure. A Cool, Bedazzled Bralette for a Night OutBe a human disco ball. Cara Delevingne’s Topshop Campaign Is Finally OutHer first for the brand. The 25 Best, Last-Minute Bathing-Suit UpgradesIncluding many on sale. Report: Cara Delevingne Will Star in the New Topshop AdsWhat can’t she do?